Two small books called General Lavr Georgievich Kornilov were published in the south Russian city of Rostov the year after Kornilov’s death. Both are rare in UK collections. For many years, the Library and its readers had been under the impression that we owned the 16-page volume by Nik. Tuzemtsev (the pseudonym of N.T. Dobrovol’skii). In fact what we have is the 48-page one by Vasilii Pronin. The printed guardbook catalogue’s entry for the book is correct, and the error likely crept in during the enormous exercise of creating electronic records for the guardbook entries in the UL’s first online catalogue. Books in non-Latin scripts particularly caused problems at the time, and we stumble not infrequently upon records which need some specialist attention. It is satisfying to sort such errors out and always enjoyable to take the opportunity to look more closely at this kind of material. Pronin’s Kornilov book focuses on its subject’s military career. After service in the Imperial Russian Army, Kornilov was placed at the head of the Provisional Government’s army following the 1917 February Revolution. He led an attempted coup, was imprisoned but escaped, and then joined and took command of the Volunteer Army in the south. Our copy of the book reached the UL in 1975, transferred from the University’s Slavonic Library, a fine collection which was later brought into the Modern and Medieval Languages Faculty Library. The book’s text is liberally covered with underlinings, largely in blue pencil. On page 31, there is a surprise. In a section about the coup, a list is given of the names of those who supported Kornilov and shared his imprisonment. The blue pencil marks one out with an asterisk which leads to a note in French: “mon oncle”. The asterisk appears at the beginning of the name Novosil’tsev (Leonid Nikolaevich Novosil’tsev (1872-1934)) but might possibly instead refer to the preceding name, Riasnianskii (Sergei Nikolaevich Riasnianskii (1886-1976)). 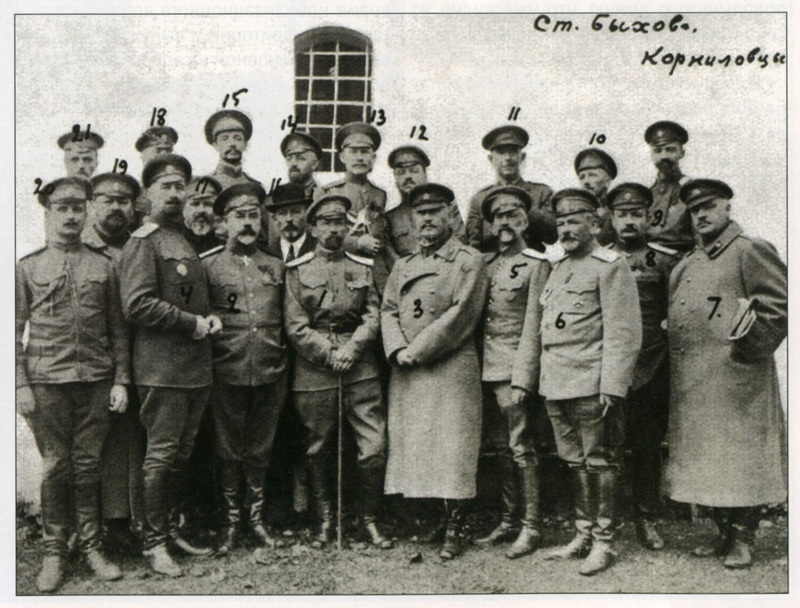 The photo below of Kornilov and the co-conspirators imprisoned with him includes both men. According to the list provided in the photo’s Wikimedia Commons page (in Russian), Novolsil’tev is number 11 (back row) and Rianianskii is number 14 (ditto, to left of window). Kornilov himself is number 1, centre-left in the front row. According to his Russian Wikipedia entry, Novosil’tsev left Russian for the Balkans via Bulgaria. Riasnianskii’s entry says that he too went to Yugoslavia before moving to Belgium after World War 2 and then finally settling in the USA. Riasnianskii also features in N. Rutych’s 1997 collective biography of senior Volunteer Army officers (586:9.c.95.607), as does Vasilii Pronin, the author of the book. Initial investigation into both men to whom the asterisk in our copy might apply has failed to draw up a notable nephew or niece who might have owned and written in the UL’s copy of the Pronin book, but any reader who has a lead is warmly encouraged to get in touch. The April 1918 Revolution exhibits can be seen here. Readers interested to find out more about the Volunteer Army and Kornilov should browse in the catalogue for the subject headings Russia (Territory under White armies, 1918-1920). Dobrovolcheskaia armiia and Kornilov, Lavr Georgievich, 1870-1918. This entry was posted in Russian, Slavonic and tagged 1917 revolutions, exhibitions, provenance, Russian history by europeancollections. Bookmark the permalink.